What better way to learn the thrill of exotic cars than from car enthusiasts themselves. Cloud 9 Exotics of the Northeast specializing in private, group and corporate rentals. Let them put you in the driver’s seat of the world’s automotive icons: Ferrari, Aston Martin, McLaren, Maserati, Porshe, Audi, Bentley, Mercedes and much more. 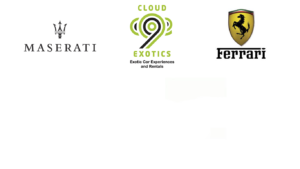 To Learn More Click the “Exotic Luxury Car Rentals NYC New York & Long Island” Logo.